Chickpeas in all their glory! 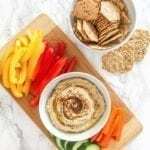 This classic is a must-have in any plant-based healthy snacking routine. Place all ingredients in a food processor. Puree until it reaches desired consistency, then transfer to a small bowl. Garnish with a drizzle of olive oil, a sprinkle of za’atar, coriander, chili powder or any of your favourite spices. Serve with pita wedges, raw veggies, or as a spread on sandwiches and wraps. For a thinner hummus, add more tahini and/or a drizzle of extra virgin olive oil as the food processor is running. It will thicken slightly in the fridge.